Things heat up if your vehicle has cooling system issues. Keep your car's engine cool by depending on Wayne's Auto Repair for radiator repair in Westerville, OH. Since a cooling system helps your car's engine remain at the right operating temperature, it's important to have a fully operational radiator. If it's damaged, your vehicle simply won't be able to handle the heat. Sometimes, all your car's radiator needs is a simple repair, or it may require something as easy as a radiator flush. However, if you have significant leaks that cannot be repaired, rely on our team for affordable radiator replacement. We install plastic, aluminum, copper, and even brass radiators for vehicles of all makes and models. Whether your radiator is old or you want a more advanced radiator, you can depend on us for a quality product at an affordable price. One of the last things you should do when you must replace your radiator is install a cheap product. We always install top-quality radiators that provide superior cooling. For instance, plastic radiators are invulnerable to corrosion, and they last for as long as you own your car. Contact us if you need radiator repair or replacement today. 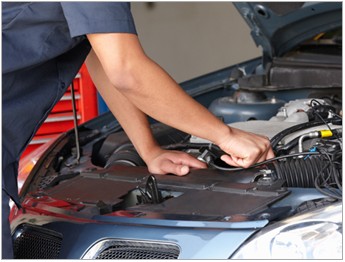 Depend on the ASE-certified technicians at our auto repair shop for prompt and complete radiator repair. If your radiator is damaged, it could cause significant problems with your engine. A hot engine can cause cracked heads, warped valves and pistons, and hundreds of dollars in repairs. When your car is steaming or your radiator is leaking, stop the car! Get immediate radiator service at our auto shop. Is It Time for a Radiator Flush? Flush away the rust, dirt, and gunk at our auto repair shop. We provide radiator flush services. We remove the old, ineffective coolant and add new coolant to provide better cooling for your engine. However, if you have significant leaks, we can repair or replace your radiator. Allow us to extend the life of your radiator and cooling system by providing radiator flushing services. We're servicing your radiator not overhauling your engine! Don't pay high prices for radiator service. At our locally owned auto radiator service, we always charge fair prices yet provide high-quality work. In addition, flushing and servicing your radiator gets rid of corroding deposits that damage your cooling systems. It ensures your car's engine stays at the right temperature all season so that you never need to worry about cooling problems. Contact us for a radiator flush that prevents rust, overheating, and other cooling system problems. We serve vehicle owners from Westerville, Columbus, Worthington, Gahanna, and New Albany, Ohio, as well as the surrounding areas.